Build decorations: Tap the yellow hard hat icon and then tap the decorations tab (fountain icon). Construct those decorations that can be bought using dollars as they are easy to earn, unlike gold, which is premium currency. For example: Flowerbed can give +12 happiness points (HP) and can be bought using only 400 dollars. It’s the cheapest decoration available. 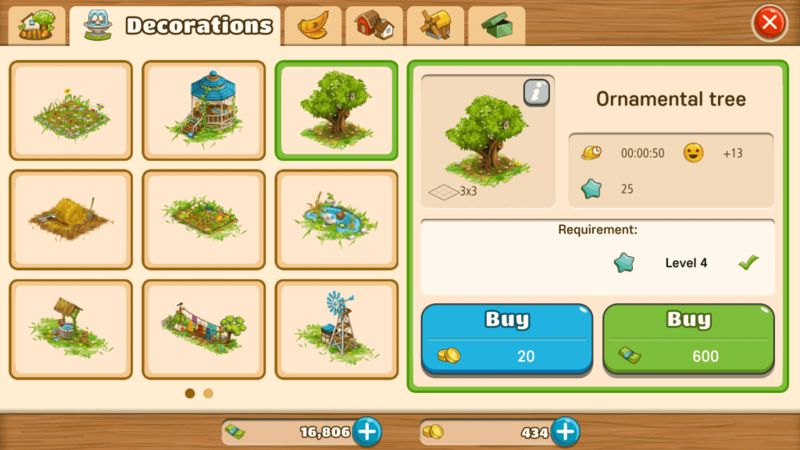 You can also purchase the Ornamental tree, which costs 600 dollars and gives +13 HP. Buy season decorations: These are special decorations that are available during certain festivals and special occasions, such as All Hallows’ Eve, Christmas etc. They offer more happiness points than normal decorations. You will need special season coupons to buy them. You can get season coupons from offers and special rewards. Look for Event decorations. They also give HP. You will need event coupons to purchase them. You can get them from offers and special rewards. If you want eggs or want to harvest crops faster, then you will have to build more than one production facility. It takes hours to harvest crops, or get eggs from chicken coop and so the only way to get more of them in less time is to have multiples of production facilities so that you get more at the same time. Let me explain this with an example: If you have only one field and you want to grow corn. When you harvest it, you will get few corns from that one field after a few minutes or hours. But if you harvest corns on two fields, you will get more corns in the same time period. Building more than one production facility, such as a field, will let you grow and harvest two different crops simultaneously or harvest the same crop at the same time. This way, you will be to get two different crops or more crops of the same type in the same time period. Every time you refer your FB buddies, both you and your friends will receive gold when they connect the game to their Facebook account. Make more friends and invite them to play this game to get more gold. Gold is premium currency and can be used to purchase decorations. Make sure you save gold only for decorations and not for purchasing production facilities or processing units as they can be easily bought using dollars. Dollars are easy to earn, gold isn’t so spend them wisely. You might think of storing your decorations in the temporary storage box to free space. Well, doing this will deduct happiness points from your total happiness score. 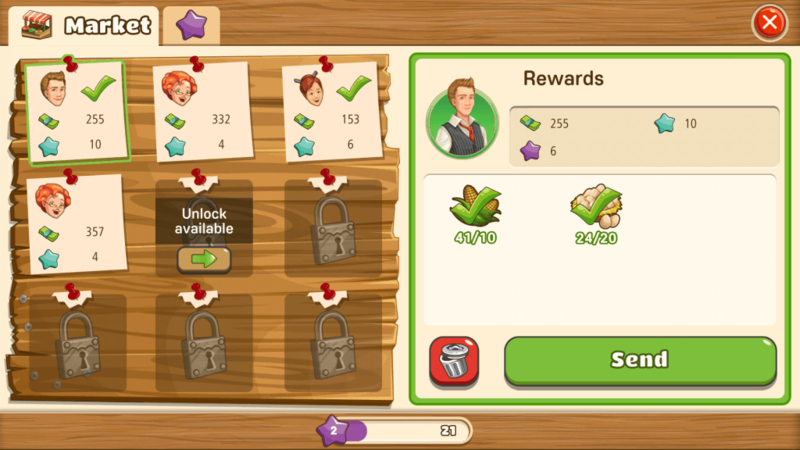 In other games, storing decorations is a norm, but not in Big Farm Mobile Harvest as they have value and are directly linked to worker happiness. If you have stored your decorations, then you should add them back to your farm immediately. Tap the yellow hard hat and then tap the green cardboard box icon (Temporary Storage). You will find your decoration. Just tap “Place” to place that decoration on your farm again. The market lets you sell farm produce to customers. You will have to fulfill a market contract to get rewards like XP and cash. Contracts can be accessed by tapping the supply truck icon. To complete a contract, produce the required number of products and then tap the “Send” button on a contract to get rewards. You can unlock additional contracts slots by collecting the required materials like roofing shingles and bricks. To get these materials, keep completing existing market contracts. You can also get materials by giving treats to your pet dog. The “Improvements” tab (purple star) is located next to the contracts tab in Market. You might want to know what improvements are. Well, they augment your contracts so that you get more rewards. 1. 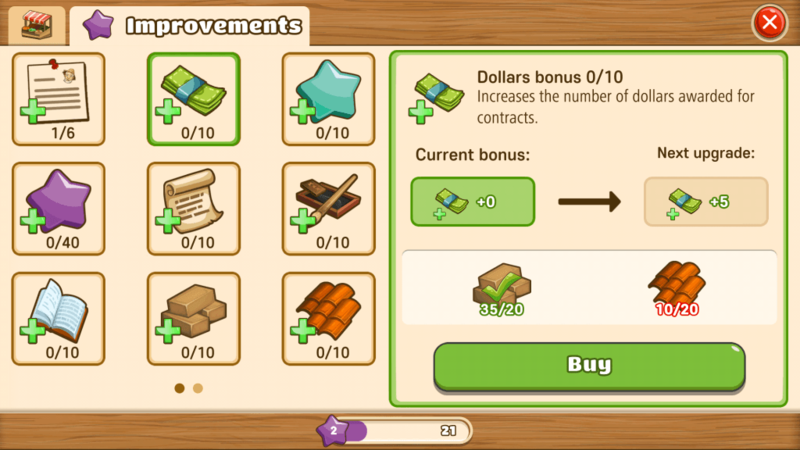 Contracts slots bonus: Buying this improvement adds an extra contracts slot. More free slots = More Contracts = More rewards. Once purchased, an additional contract slot will be unlocked in the market tab. It requires Bricks and Roofing Shingles. 2. Dollars bonus: If you want more dollars per contract, then you should purchase Dollars bonus. Requires bricks and roofing shingles. 3. Player XP bonus: Everyone wants to level-up faster and buying Player XP bonus increases the amount of player XP awarded after completing contracts. Instead of storing buildings, why don’t you buy more farmlands so that you can accommodate more production facilities and processing units? A new farmland is available for purchase at a certain level. You will have to reach that player level and have enough dollars to buy it. 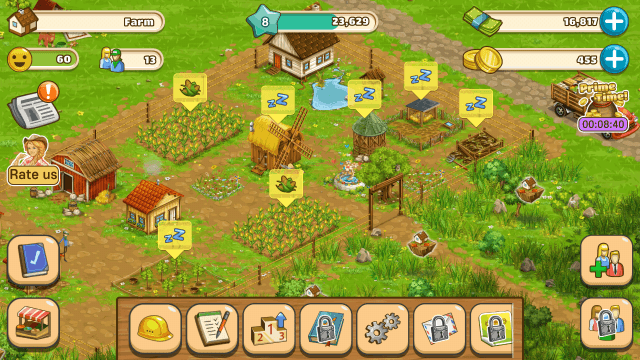 For example: You can buy farmland for 4500 dollars when you reach player level 10. Reaching new levels will also let you unlock special in-game features that will help you become a rich farmer. Completing quests is a sure-shot way of getting XP. Tap the blue book to get a list of available quests. Complete them to get cash and XP. Fulfill contracts to get XP. If you want more XP per contract, just buy the “Player XP Bonus” improvement. You will also get XP each time you construct a new building, purchase decorations or upgrade a building. Does anyone know how to start your own cooperative? To start your own co-op, you will need to reach level 9. Also, make sure you are not a part of any co-op. once you reach level 9, you can start on your own but it will cost you 375 gold. We need a new bartender on the island! Too slow. Is there no way to produce faster? I am at level 32 and maybe get enough to fulfill 4 contracts a day. Anyone have a strategy? On adventure market how do you grow peanuts? To grow peanuts, you will have to be on adventure level 5 and your field must be upgraded to level 2.